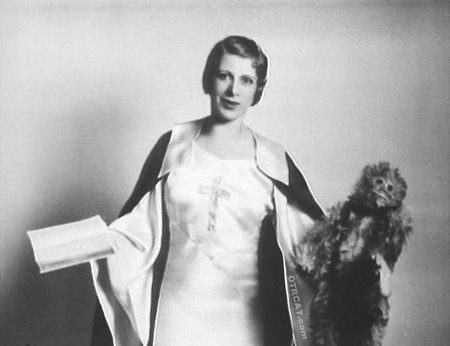 Aimee Semple McPherson, also known as Sister Aimee or simplyThe Sister, was a Canadian-American; Pentecostal evangelist and media celebrity in the 1920s and 1930s, whose dynamic evangelistic ministry birthed the present day Foursquare Gospel Church. McPherson has been noted as a pioneer in the use of modern media, as she used radio to draw on the growing appeal of popular entertainment in North America and incorporated other forms into her weekly sermons at Angelus Temple. She was one of the first female evangelists and the founder of the Foursquare Gospel church. In her time, she was the most publicized Christian evangelist, surpassing Billy Sunday and her other predecessors. She conducted public faith healing demonstrations before large crowds; testimonies conveyed tens of thousands of people healed. McPherson’s articulation of the United States as a nation founded and sustained by divine inspiration continues to be echoed by many pastors in churches today. Her preaching style, extensive charity work and ecumenical contributions were a major influence to Charismatic Christianity in the 20th century. Aimee Elizabeth Kennedy was born on October 9, 1890, near Ingersoll, Ontario, Canada. Her father, James Morgan Kennedy (1836-1921), was a struggling farmer. Her mother, Mildred “Minnie” Pearce (1862-1947) was a former member of the Salvation Army (1865; founded by William Booth [1829–1912] as a religious organization with military structure for the purpose of bettering life for the poor and evangelizing the world). Her father, a farmer and bridge builder, was a Methodist organist and choir director who taught his young daughter to play the piano and organ. Soon after Aimee’s birth, her mother took her to the Salvation Army and dedicated her to God’s service. Aimee’s training was particularly geared toward religious work. As a child she would play “Salvation Army” with her classmates, and at home she would gather a congregation with her dolls, giving them a sermon. As a teenager, McPherson strayed from her mother’s teachings by reading novels and going to movies and dances, activities which were strongly disapproved of by both the Salvation Army and the religion of her father. Novels, though, made their way into the Methodist Church library and with guilty delight, McPherson would read them. At the movies, she recognized some of her fellow Methodist church members. She learned too, at a local dance she attended, that her dancing partner was a Presbyterian minister. In high school, she was taught Charles Darwin’s Theory of Evolution. She began to quiz visiting preachers and local pastors about faith and science, but was unhappy with the answers she received. She wrote to the Canadian newspaper, Family Herald and Weekly Star, questioning why taxpayer-funded public schools had courses, such as evolution, which undermined Christianity. This was her first exposure to fame, as people nationwide responded to her letter. While still in high school, after her Pentecostal conversion, McPherson began a crusade against the concept of evolution, beginning a lifelong passion. When Aimee was in high school, she began to question her religious beliefs. While attending a revival meeting in December 1907 at the age of seventeen, she experienced Pentecostal conversion under the guidance of Scottish evangelist Robert Semple. Aimee met Robert James Semple, a Pentecostal missionary from Ireland. There, her faith crisis ended as she decided to dedicate her life to God and made the conversion to Pentecostalism as she witnessed the Holy Spirit moving powerfully. At that same revival meeting, Aimee became enraptured not only by the message that Robert Semple gave, but also with Robert himself. She decided to dedicate her life to both God and Robert, and after a short courtship, they were married on August 12, 1908, in a Salvation Army ceremony, pledging never to allow their marriage to lessen their devotion to God, affection for comrades, or faithfulness in the Army. Together, they studied the Bible and became very knowledgeable. After embarking on an evangelistic tour to China, both contracted malaria. Robert also contracted dysentery, of which he died in Hong Kong leaving her pregnant and penniless. Aimee recovered and gave birth to their daughter, Roberta Star Semple, as a 19-year-old widow. After the birth of Roberta Star, she returned home and continued her Pentecostal work. On board a ship returning to the United States, Aimee Semple started a Sunday school class, then held other services, as well, oftentimes mentioning her late husband in her sermons; almost all passengers attended. 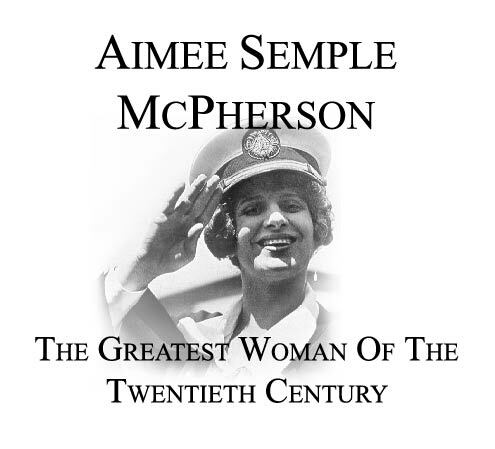 Shortly after her recuperation in the United States, Semple joined her mother Minnie working with the Salvation Army. While in New York City, she met Harold Stewart McPherson, an accountant. They were married on May 5, 1912, moved to Providence, Rhode Island and had a son, Rolf Potter Kennedy McPherson, in March 1913. During this time, McPherson felt as though she denied her “calling” to go preach. After struggling with emotional distress and obsessive–compulsive disorder, she would fall to weep and pray. She felt the call to preach tug at her even more strongly after the birth of Rolf. Then in, 1914, she fell seriously ill, and McPherson states she again heard the persistent voice, asking her to go preach while in the holding room after a failed operation. McPherson accepted the voice’s challenge, and she suddenly opened her eyes and was able to turn over in bed without pain. One spring morning in 1915, her husband returned home from the night shift to discover McPherson had left him and taken the children. A few weeks later, a note was received inviting him to join her in evangelistic work. Her husband later followed McPherson to take her back home. When he saw her, though, preaching to a crowd, he witnessed her transformation into a radiant, lovely woman. Before long, he became her fellow worker in Christ. Their house in Providence was sold and he joined her in setting up tents for revival meetings and even did some preaching himself. Throughout their journey, food and accommodations were uncertain, as they lived out of the “Gospel Car”. Her husband, in spite of initial enthusiasm, wanted a life that was more stable and predictable. Eventually, he returned to Rhode Island and around 1918 filed for separation. He petitioned for divorce, citing abandonment; the divorce was granted in 1921. She married again on September 13, 1931 to actor and musician David Hutton, followed by much drama, after which she fainted and fractured her skull. While McPherson was away in Europe to recover, she was angered to learn Hutton was billing himself as “Aimee’s man” in his cabaret singing act and was frequently photographed with scantily clad women. 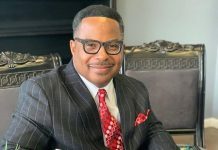 Hutton’s much-publicized personal scandals were damaging the Foursquare Gospel Church and their leader’s credibility with other churches. McPherson and Hutton separated in 1933 and divorced on March 1, 1934. McPherson later publicly repented of the marriage, as wrong from the beginning, for both theological and personal reasons and therefore rejected nationally known gospel singer Homer Rodeheaver, a more appropriate suitor, when he eventually asked for her hand in 1935. In August 1925 and away from Los Angeles, McPherson decided to charter a plane so she would not miss giving her Sunday sermon. Aware of the opportunity for publicity, she arranged for at least 2000 followers and members of the press to be present at the airport. The plane failed after takeoff and the landing gear collapsed, sending the nose of the plane into the ground. McPherson boarded another plane and used the experience as the narrative of an illustrated Sunday sermon called “The Heavenly Airplane”. The stage in Angelus Temple was set up with two miniature planes and a skyline that looked like Los Angeles. In this sermon, McPherson described how the first plane had the devil for the pilot, sin for the engine, and temptation as the propeller. The other plane, however, was piloted by Jesus and would lead one to the Holy City (the skyline shown on stage). The temple was filled beyond capacity. On another occasion, she described being pulled over by a police officer, calling the sermon “Arrested for Speeding”. Dressed in a traffic cop’s uniform, she sat in the saddle of a police motorcycle, earlier placed on the stage, and revved the siren. One author in attendance, insisted she actually drove the motorcycle, with its deafening roar, across the access ramp to the pulpit, slammed on the brakes, then raised a white-gloved hand to shout “Stop! You’re speeding to Hell!” Since McPherson gave some of her sermons more than once, and with variations, the possibility existed both versions might be true. McPherson employed a small group of artists, electricians, decorators, and carpenters, who built the sets for each Sunday’s service. Religious music was played by an orchestra. McPherson also worked on elaborate sacred operas. One production, The Iron Furnace, based on the book of Exodus, told of God’s deliverance as the Israelites fled slavery in Egypt. Some Hollywood movie stars even assisted with obtaining costumes from local studios. The cast was large, perhaps as many as 450 people, but so elaborate and expensive, it was presented only one time. Rehearsals for the various productions were time-consuming and McPherson “did not tolerate any nonsense.” Though described as “always kind and loving”, McPherson demanded respect regarding the divine message the sacred operas and her other works were designed to convey. Even though McPherson condemned theater and film as the devil’s workshop, its secrets and effects were co-opted. She became the first woman evangelist to adopt the whole technique of the moving picture star. McPherson desired to avoid the dreary church service where by obligation parishioners would go to fulfill some duty by being present in the pew. She wanted a sacred drama that would compete with the excitement of vaudeville and the movies. The message was serious, but the tone more along the lines of a humorous musical comedy. Animals were frequently incorporated and McPherson, the once farm girl, knew how to handle them. 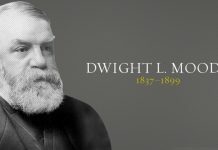 McPherson gave up to 22 sermons a week and the lavish Sunday night service attracted the largest crowds, extra trolleys and police were needed to help route the traffic through Echo Park to and from Angelus Temple. To finance the Angelus Temple and its projects, collections were taken at every meeting, often with the admonishment, “no coins, please”. Her faith-healing demonstrations gained her unexpected allies. When a Romani tribe king and his mother stated they were faith-healed by McPherson, thousands of others came to her, as well, in caravans from all over the country and were converted. The infusion of crosses and other symbols of Christianity alongside Romani astrology charts and crystal balls was the result of McPherson’s influence. Prizing gold and loyalty, the Romani repaid her in part, with heavy bags of gold coin and jewels, which helped fund the construction of the new Angelus Temple. In Wichita, Kansas, in May 29, 1922, where heavy perennial thunderstorms threatened to rain out the thousands who gathered there, McPherson interrupted the speaker, raised her hand to the sky, and prayed, “let it fall (the rain) after the message has been delivered to these hungry souls”. The rain immediately stopped, an event reported the following day by the Wichita Eagle on May 30: “Evangelist’s Prayers Hold Big Rain Back,” For the gathered Romani, it was a further acknowledgement “of the woman’s power”. 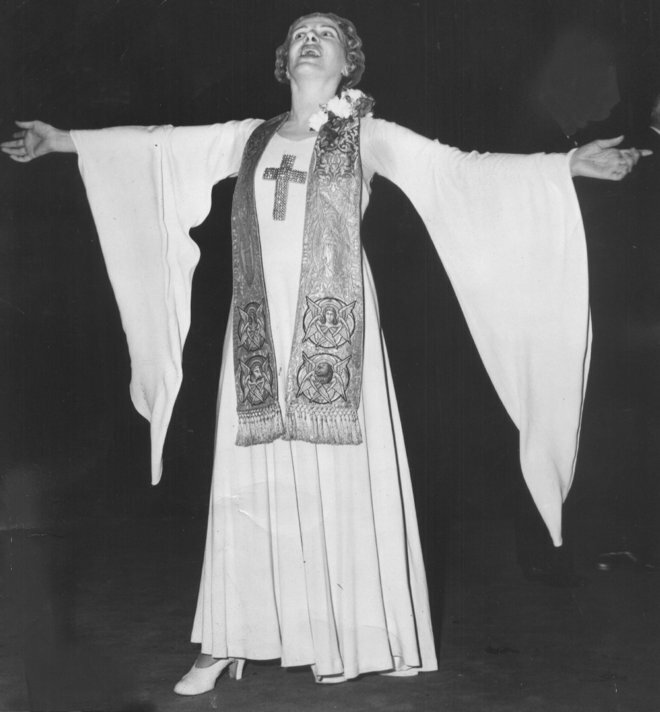 The Faith Healing Ministry of Aimee Semple McPherson were extensively written about in the news media and was a large part of her early career legacy. No one has ever been credited by secular witnesses with anywhere near the numbers of faith healings attributed to McPherson, especially during the years 1919 to 1922. 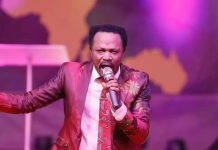 Over time, though, she almost withdrew from the faith-healing aspect of her services, since it was overwhelming other areas of her ministry. By 1920 McPherson was permanently established in Los Angeles, California. In 1923 she and her followers dedicated Angelus Temple. She called her new breed of Christian church the Foursquare Gospel, a complete gospel for body, soul, spirit, and eternity. Seating over five thousand people, this served as her center of activity. Backed by a sharp business manager (her mother), McPherson developed a large group of devoted followers. She also became a community figure in tune with the publicity-oriented life of Los Angeles, the film capital of the world. Photo of a crowd outside the Angelus Temple, circa 1923-35, courtesy of the California Historical Society Collection, USC Libraries. A popular evangelist, McPherson thrived on publicity and sensationalism (causing an intense and/or unnatural emotional reaction). The most astounding incident occurred in 1926, when McPherson, believed to have drowned in the Pacific Ocean, “miraculously” reappeared in the Mexican desert. 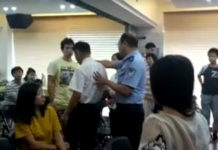 Some challenged her tale of kidnapping and mistreatment, claiming she had been in hiding with one of her male followers. The resulting court battle attracted national attention. On September 26, 1944, McPherson went to Oakland, California, for a series of revivals, planning to preach her popular “Story of My Life” sermon. When McPherson’s son went to her hotel room at 10:00 the next morning, he found her unconscious with pills and a half-empty bottle of capsules nearby. She was dead by 11:15. It was later discovered she previously called her doctor that morning to complain about feeling ill from the medicine, but he was in surgery and could not be disturbed. She then phoned another doctor who referred her to yet another physician; however, McPherson apparently lost consciousness before the third could be contacted. The autopsy did not conclusively determine the cause of McPherson’s death. She had been taking sleeping pills following numerous health problems – including “tropical fever”. The coroner said she most likely died of an accidental overdose compounded by kidney failure. The cause of death is officially listed as unknown. Given the circumstances, there was speculation about suicide, but most sources generally agree the overdose was accidental, as stated in the coroner’s report. Forty-five thousand people waited in long lines, some until 2 am, to file past the evangelist, where, for three days, her body lay in state at the Angelus Temple. Within a mile-and-a-half radius of the church, police had to double park cars. It later took 11 trucks to transport the $50,000 worth of flowers to the cemetery which itself received more telegrammed floral orders than at any time since Will Rogers’ death almost 10 years earlier. A Foursquare leader noted that to watch the long line pass reverently by her casket, and see tears shed by all types of people, regardless of class and color, helped give understanding to the far-reaching influence of her life and ministry. 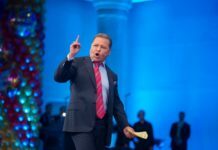 The Foursquare Gospel church continues to thrive in America and around the world today. Currently, the Church has more than 1,700 U.S. churches. Globally, The Foursquare Church has more than 66,000 churches and meeting places in 140 countries and territories. 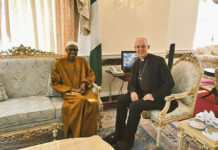 In Nigeria, the church has not less than 4032 churches spread over 154 districts and 824 zones as at September 2018.